Late summer in England heralds handsome gluts of bountiful garden harvests. Home growers are busy prepping fruit and vegetables for what will soon be groaning freezers, bagging seeds and generally having an outdoor clear up in readiness for the more inclement months ahead. Protecting our houses and businesses for winter isn’t always at the forefront of our minds on any particular summer’s day but it’s enormously satisfying if one’s fully prepared well ahead for winter frosts, lashing rain storms and snow. As the season moves into Autumn, the house and garden maintenance list is ticked and ticked again – chimneys are cleaned, log piles re-stocked and stacked, garden debris cleared, tender plants brought in and exterior painting, stone, brickwork and wood protecting completed. Often omitted from this list, as well as a painless one-off project to complete, is a striking to look at and sheltering to stand under, front door porch cover or canopy – welcome protection for doorways, visiting guests and those with bottomless bags and brief cases who frequently find themselves rummaging for keys in all weathers. Time to consider the possibilities of a cosy porch in a storm. Here in Britain, we are lucky to be the guardians of a glorious melting pot of heritage buildings ranging from ancient medieval through Elizabethan, Georgian, Victorian and Edwardian architecture to more recent days. Well-designed houses and apartments from the 1950’s and 60’s can now even make the grade for period architecture. From where our workshop is near Bath across to London, up to Edinburgh and all cities and villages around and in between, there are homes and businesses with beautifully built doorways that are crying out for stylish shelters. The period property doors of cottages, country houses, town houses, homes, hotels and other smart businesses all qualify for a heritage-inspired, long-lasting porch canopy or cover. Investing in well-designed ironwork or galvanised steel, artisan porch structures shows real respect too for the well-weathered look of old stone and brickwork. Expert advice is on hand at Garden Requisites for careful installation. It’s not just period properties that can benefit from sturdy, smart porch covers. Owners of new builds are often eager to soften newly hewn hard lines. Handcrafted porch designs can create an attractive flourish as well as providing useful wirework side trellis through which to grow fast-growing climbing plants. Within a few weeks, the results can be so much more inviting, more lived in and welcoming. Plan to stand out from the crowd. The front of the house is not the only area to enhance. Lengthy stretches of patio French doors, outbuildings entrances, side and back doors can have canopies installed so that extra shelter is provided. Throw open the doors during warm summer showers when the longer days come around again! 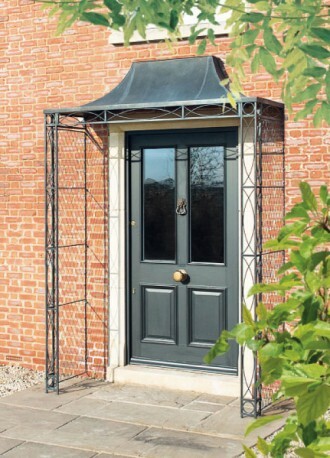 Whether the property in question is period or contemporary, Garden Requisites can provide designs that may be scooped, arched or wirework in nature, with a choice of finishes in zinc galvanised solid steel or ironwork. We can also advise on the best looks for a specific style of property. Standard sizes can be ordered but it’s no problem for us to amend designs to accommodate architectural features and light fittings. Each doorway is different so we work closely with customers to ensure that the fit is snug and very, very smart. Feeling a chill in the air? Come on in and light a fire ready for your Autumn visitors. You may be needing a handcrafted fireguard for that. Neatly, it can match your porch cover. Not many home owners can say that.